An air purifier is basically a device that removes contaminating substances from the air in an area or room. They are very useful especially for people who have severe allergic reactions or who have asthma. In some instance, an air purifier can be used to prevent smoke fumes from reaching non-smokers. Air purifiers are manufactured either as a small single unit or a large complex unit that is mostly used in hospitals and industries. In most industries and commercial setting, air purifiers are used to remove toxic impurities such as CO2 from the air. 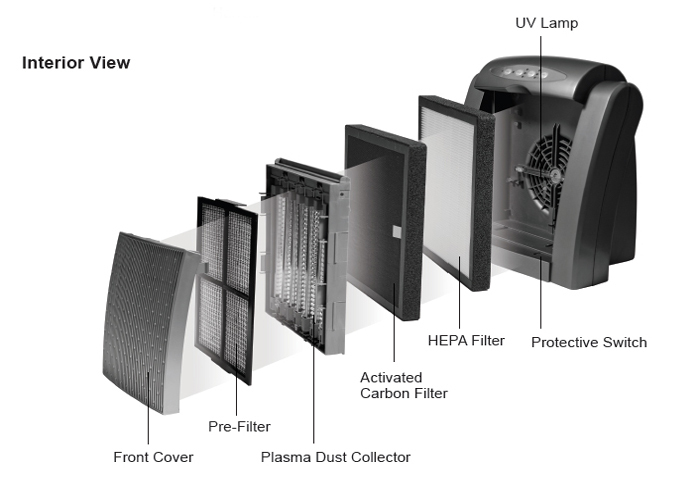 In this article, we are going to discuss the various parts that make up an air purifier. The case serves as a protective cover to an air purifier. They are made up of a thick material (usually plastic). The major function of the case is to keep the air purifier in perfect condition as well as to protect it for certain elements that may reduce its efficiency and performance. The fan basically helps to distribute the air that has been cleaned by an air purifier in a quick and even manner. Without the aid of the fan, clean air will circulate at a much slower rate, which will create a detrimental avenue for the user to suffer a pinch of the effect of indoor air pollution. A HEPA filter helps to absorb all particles that passes through the filter. The quality of fibre determines the efficiency of the HEPA it is made from. The HEPA filter removes more than 99.9% of air particles, especially larger ones. They work like an ionic cleaner, that’s to say, they use strong electrical charges to remove particles from the air. They are also known as EPS, and they possess some plates that are negative and positive. The working principle of an electrostatic precipitator can be likened to that of a magnet, in that, a charge emitted into the air draws down a particle of an opposite charge. Activated carbon is like a sponge, and can absorb chemical and molecular particles easily, but does not absorb particles of larger dimensions. Activated carbon filtration is a process by which gaseous contaminants are transformed into solid particles. They are used commonly in an industrial environment alongside with other air filtration technologies such as HEPA and other particles absorbing materials. The assembly plays the role of charging all particles in the air that passes through an air purifier. The charged particles are therefore attracted to the filter element allowing only purified air to pass through the filter. The fan is designed in an adjacent position, so as to enable the assembly to ionize as much air as possible, thereby improving the performance of an air purifier. Each of the parts of an air purifier plays a very important role in the absorption of contaminants from the air.